The Northern Pacific (NP) Railroad announced in 1879 that it would push west with the addition of 200 miles of line to the Yellowstone River near present day Glendive Montana. 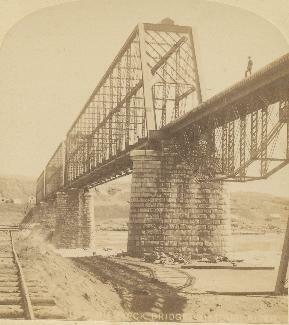 While ferrying across supplies was a expensive temporary solution, bridging the "Big Muddy" would be required to complete a northern branch of a transcontinental rail line. The Missouri River narrowed north of Bismarck. Construction of a of a levy could sweeze the river together further. Still, three separate bridge spans each 400 feet in length would be required to connect two land-supported approaches at each end. Announcement of the projects prompted an influx of thousands of workers to the area. And the location of the work camp which would someday become Mandan was set. The name "High Bridge" refers to the 70-foot river clearance intended to protect the structure from the dual danger of widely fluctuating river levels and the huge chunks of ice common in early spring on the Upper Missouri River. George S. Morison also incorporated into the design metal sheaths or blades on the upstream side of the piers to break up the ice sheets. The bridge relies on piles driven into the sand and river bottom and the construction of stone piers upon which the bridge deck rests. To build the piers, caissons measuring 74 feet by 25 feet by 17 feet high were fabricated from timber and iron, were floated into position and then sunk. Concrete was poured into the casison, filling it above a false floor and pushing the caisson into the river bottom. Men would enter a hollowed portion of the caisson bottom through an airlock. These workers would dig into the river bottom allowing the caisson to continue to sink. Eventually the caisson reached a firm layer and further excavation stopped. Granite piers were subsequently built upon the caisson footers. Work began on the bridge on September 1, 1881. The east approach span was finished May 9, 1882. The west approach span was completed June 3, 1882. The center span was completed October 18, 1882. The final cost was $1.08 million. Between 200 and 600 men worked on it at any given time, dependant on what aspects of the bridge were under construction. The first spans were flat topped but were replaced in 1905 when the loads which could be transported by improved locomotives exceeded the capacity of the initial design. The bridge trusses were rebuilt atop the existing piers using sturdier and elegant arc-topped spans which remain in service today.